"What we're going to do today is play a really cool game." That's Ameer Mourad, a spiky-haired 20-something who teaches a sixth-grade class called "The Way Things Work," which is a blend of science and math. His school, Quest to Learn (also called Q2L or just "Quest"), is one of only two public schools in the United States that bases its curriculum on game theory and game mechanics. On this spring morning, Ameer -- the kids here call teachers by their first names -- didn't spend too much time lecturing students on the topic at hand: the metric system. Instead, he launched into a board game called "Metric Mystery," which a full-time game designer who works at the school helped create specifically for the lesson. Sitting near a wall of lockers in this high-ceilinged classroom, with a view of the New York City skyline, one of Ameer's students, Duke Tsapalas, is wearing soccer garb and a floppy mop of brown hair. Duke has always been a good student, but he and his mom decided he would come to Quest for sixth grade in hopes that it would be more engaging for him than a traditional classroom. At first, his mother worried about the decision. Would he really learn more in this game-like environment? What about standardized tests and college? "It's frightening and new," said Heather Church, his mom. "It's a big roll of the dice." They decided it was worth the gamble. As the kids got into the "Metric Mystery" game, the classroom filled with a commotion so loud it would make Chuck E. Cheese employees wince. Buried in the noise, however, were legitimate conversations about metrics: "I think it's 100 centimeters!!" one kid yelled out. "What's the metric prefix on that?" asked another. And then there's this: "I win! I win! I win!" Quest is middle school with a gamified twist. In other classes, students create virtual worlds in the online game "Minecraft," communicate over an in-house social network, and learn about Pi by stepping into an immersive digital environment that is controlled by a dozen or so infrared cameras that are tacked to the classroom walls. The language at Quest, too, is foreign outside the walls of this seven-story building. Instead of A's and B's, students advance through game-like levels -- from "novice" to "apprentice" to "expert." Final exams are named "Boss Level," a reference to the final stage of video games where players must face the biggest-baddest villain. Having completed its third year and with the first crop of high school students starting in the fall, Quest is trying to prove that games are not only fun, they're actually the best tools for teaching students how to exist in the 21st Century workforce. The school is accumulating evidence that this method of "game-like learning" should be exported to schools across the country or around the world. A sister school in Chicago, called ChicagoQuest, employs a similar approach and started offering middle school classes in fall 2011. Requests for more schools like this come in weekly -- from places as far-flung as Lebanon, said Katie Salen, the school's co-founder and head a group called the Institute of Play, which partners with the public school system to run Quest. "We consider this a research space," said Brendon Trombley, a scruffy game designer who works at the school full-time, helping teachers develop game-centric curriculum. "So hopefully we can learn from it and then have some materials to share." Learning -- for students like Duke, for parents and for educators -- is an ongoing process here. And it's a process proponents say could create a class of brighter students. That's easy if you talk to James Gee, a presidential professor at Arizona State University's department of education, who has made a career out of assessing the usefulness of games. "What a video game is, is it's just a set of problems to solve -- that's it," he said. "And it has a win state. You get feedback and you know when you've solved the problem. And then the game designer has to create good motivation for you to do that." Take "Angry Birds" as an example. It's a game where smartphone owners are asked to use a digital slingshot to catapult birds across the screen and into towers of sticks with evil pigs -- their enemies -- hiding inside them. That game is compelling, Gee would argue, because there is a clear problem (pigs that need to be pummeled), a feedback system (after each level, players are given stars based on how quickly they're able to pummel said pigs) and, to some degree, an inherent motivational structure. Players who want to advance to harder levels (to "level-up" in gamer-speak) must improve their scores to do so -- maximizing efficiency. Quest is appropriating those ideas in a system it calls "game-like learning." Instead of regular classes, kids are sent on missions where they're expected to make their own discoveries and compete against other students or classrooms from the school. Sometimes students here use video games and other high-tech tools -- there's a 3-D printer on site; laptops and iPads seem to be everywhere; kids play "The Sims" as part of class -- but often they don't. Duke's "The Way Things Work" classroom looks pretty much like any other eclectic science class in America: bright posters on the walls, class pets in the back corner, a model skeleton leaning against the window. It's how the class is framed that's different. Kids are told they are no longer students but explorers. They're put inside a narrative that's bigger than them -- they're dispatched on a "mission" to discover, in this case, the many mysteries of the metric system. The magic of the school is that, just like in a video game, when one challenge ends another begins, co-founder Salen said. You move to the next level. The school is designed to create challenges that the students actually want to tackle, without worrying about grades or tests, just because they're actually interested in the world. Games "create a reason for young people to want to engage in a problem or around a set of content," Salen said. "And then you make those resources around them available so they can do work and practice around that problem." 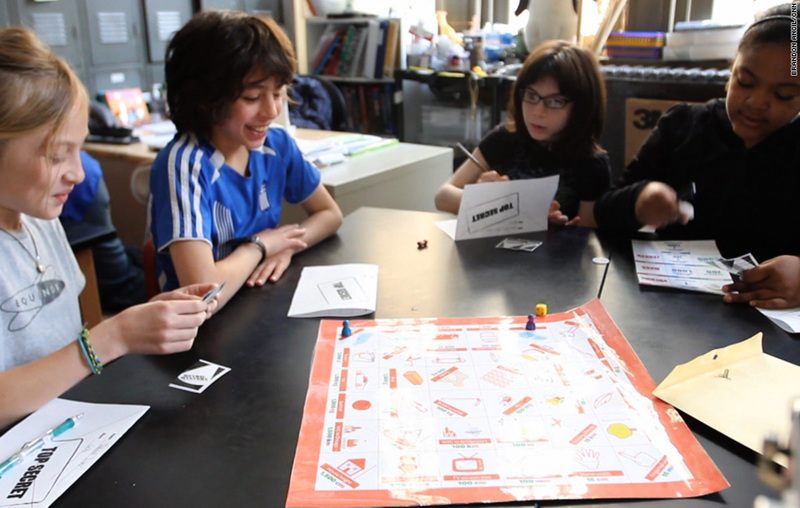 Students learn the metric system with a "Clue"-like board game at Quest to Learn in New York. Duke's mother, Heather Church, at first was confused by the homework he brought to their apartment -- and by the strangely named topics he was studying at Quest. "It's an entire language that befuddles me," she said. The class names kind of freaked her out. "The Way Things Work," instead of science. "Codeworlds" instead of English and math. "Being, Space & Place" instead of history or social studies. Her son told her about "mindwarmer" exercises he did in the morning to get prepared for the day, and about the "boss level" activities at the end of the trimesters. To learn the Spanish words for food, he's played a digital version of "Guess Who" on an iPad -- instead of listening to a lecture. There were moments when she wondered if these wacky-sounding classes and digital games were really preparing her son for all of the traditional benchmarks of American education. How would he do in standardized tests and college entrance interviews? But her son's newfound enthusiasm for the school quickly won her over. From Duke's perspective, Quest to Learn is "like Hogwarts," the wizard school in the "Harry Potter" books (he's read all of them). Of the weird terminology the school employs, he said: "It's a new language with magical words." To him, it wasn't strange at all. It was a highly engaging world that made him want to learn more. The more Church thought about it the more she liked the idea. "He became the leader of the education process," she said. As Duke started teaching his mom about the games he was playing at school, she realized she had been using the same techniques as Quest -- motivation and challenges with constant feedback and rewards -- at home. She and Duke have competitions, for example, to see who can unload the dishwasher fastest. They keep track of their times and talk smack to each other to try to make the chore more enjoyable. And Church also makes a race out of Duke's morning routine. He tries to get out of bed and brush his teeth before a song has stopped playing on the radio. The more she thought about it, the more Church realized that Quest to Learn isn't just a place with fancy technology where kids play video games. It supports a completely new way of thinking -- one that Church has decided is a lot like the game "Angry Birds", which she loves to play. It makes kids want to strive to do better -- to earn better scores and to level-up to new challenges, always trying to improve. They play not because they have to, but because they really want to. She thinks striving for that kind of learning is worth the risk. "You throw it against the wall and see if it sticks." Quest to Learn is a collaboration between the nonprofit Institute of Play and the Department of Education. It's a public school that operates on a standard public-school budget, Salen said, but it has the support of three on-site game designers and a co-director who are paid by the Institute, which runs on donations, not by the government. The school spends $24,021 in public money per student at the school, compared to an average of $18,419 for the rest of the New York City school district, according to an online report. Additionally, the Institute of Play has received $1.5 million over the past three years from the MacArthur Foundation to help develop and implement its curriculum at the school, Salen said. Much of that money went toward developing games and curriculum for both the Quest schools in New York and Chicago. Salen maintains, however, that other schools could afford to adopt game-like curriculum. The combination of educators and technologists is part of Quest's special sauce. Game designers like Brendon Trombley, who helped develop the "Metric Mystery" game played by Duke's class, hold weekly meetings with teachers to develop games that will suit their needs. The designers work out of an office in the school called MissionLab, which is full of piles of obscure board games. The designers share a cafeteria-style table as a workspace, much like you'd see at young tech companies. The designers come to the classroom from time to time to explain the games they've created. Brendon, for example, came to Ameer's class, clutching a coffee cup with both hands and with brown hair dangling over his eyes, to explain "Metric Mystery." The class gathered around in a circle on the floor. The custom-made "Metric Mystery" board is divided into a grid of 36 squares, Brendon told his rapt audience. On each, there's a picture and a measurement: Gorilla, 100 kg; Saucepot, 100 cl; NYC to Chicago, 1,500 km. Each student would be given cards with items and measurements on them. Three cards, like in "Clue," were reserved for a "top-secret envelope." Your mission, Brendon told the sixth graders, is to use the process of elimination to figure out which cards are hidden. You must solve the "metric mystery." "You guys are all game designers, right?" Brendon asked the 11- and 12-year-olds. "OK, well put your game-designer thinking caps on and analyze your experience," Brendon said. "That way, when it comes time to give me feedback, you'll have very good gaming strategies to offer." He needs feedback to see if games like this actually are effective at teaching students a new concept -- or if they're just a distraction. The involvement of game designers is a source of controversy both in and outside the school. Some teachers at Quest said the collaboration process sometimes is intrusive and that the games developed for their classes don't always work well. "In some classes it's a struggle to get even half of the students to turn in their work," said Lauren Gabrielle, who teaches a media arts class called "Sports for the Mind." But she said the school is still experimental and should be given time to work things out. "It's new," she said. "It's growing. It's still finding its voice." Part of that process is figuring out the "balance between control in chaos," as it is in any middle school, said Salen, from the Institute of Play. "Collaboration and hands-on learning can be messy and it takes awhile for teachers who have been working in traditional classrooms to find that balance," she said in an e-mail. "We are a new school with a new staff and these kinds of expertise take time to develop; but that's what makes it interesting as a model intent on helping to change traditional teacher practice." One afternoon, Lauren's class was building cardboard and construction-paper models of New York landmarks, a lesson that leads up to the challenge of building 3-D models in the computer. But the room erupted into chaos. Kids were running around in circles. One poured glue all over an arm. Another dumped a bucket of small plastic beads on the floor. Lauren kept her cool as she tried to make sense of the madness, but she struggled to get the students to clean up after the mess. She admits she sometimes wishes she could just teach in a "traditional" classroom again, because teaching with games all of the time can be challenging. She wondered aloud if the Quest method could have helped her solve the problem. "Maybe I should have tried making cleanup a game," she said with a laugh. The games Quest has accumulated over the past three years could be exported -- or sold -- to other schools across the country or around the world. But the school faces considerable obstacles to its continued existence, much less expansion, said Gee, the professor at Arizona State. Salen says she is in constant battles with the New York Department of Education over the technological tools the school uses. (Any website with the word "game" in it is automatically banned from the schools' Internet, she said.) And the state requirements -- standardized tests and reports on improvement -- are so streamlined that it's difficult to break far from traditional grading structure. For that reason, Quest recently started issuing normal A-B-C report cards. "It wasn't the right battle to fight," Salen said. Without major changes to educational policy, the Quest schools likely will fail, said Gee. "The real question is not whether Quest can survive," he said. "It's whether the society can survive with schools as bad as the ones we have. The schools we have are designed to prepare you for a service job -- Walmart or something." Quest, meanwhile, he said, prepares students to solve problems, which is what many jobs in the era of Google and Wikipedia call for. Not rote memorization. "Our assessment system is out of kilter with learning," Gee said. "And until we change the assessment system, the assessment system will kill any new models (of schools) because we'll keep teaching for the old test instead of teaching the new skills." Salen, however, is optimistic about the school's future. 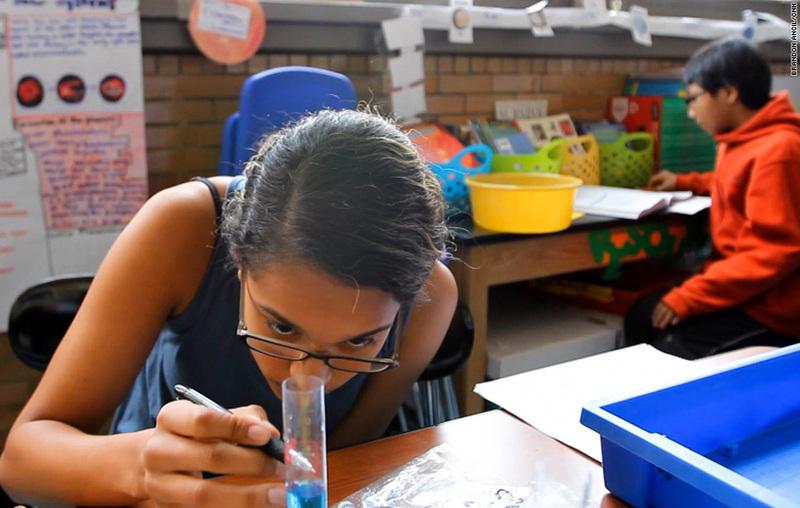 Test scores, an admittedly conventional metric, show the Quest kids have outperformed peers in the New York City school system in each of the last three years, in both English Language Arts and Math, according to data provided by the school. The only exception was 2010 math scores, when the school averaged 671 compared to 675 for the city. Of the school's 70 eighth graders in 2012, about 40 chose to stay with Quest for high school. Those who are leaving are going to some of the best schools in New York, Salen said. In 2011, the most recent year reports are available online, the school received a "B" grade for overall performance from the New York City Department of Education, and a "C" for "student progress," which measures improvement in test scores year over year. Salen says how she measures performance isn't quantitative: It's the engagement she sees in students at the school -- the attentive look kids have on their faces when they're playing the games; the way they're able to speak clearly about what they're learning and why it's important. She sees the school as a "beacon" of hope for other schools that would want to try something similar. If she can do this in such a tough environment -- New York City's public school system -- then it's hard to think others wouldn't be able to try, too, she said. Gregg Betheil, executive director for school programs and partnerships at the New York City Department of Schools, praised the Quest learning model and said aspects of it are "already finding their way into the DNA of our school system." "They start with a really simple idea -- kids like to play video games, and games in general," he said of Quest. "They don't always like the learning opportunities they have. Not that we should be having them playing video games all the time, but there are things from the design of games that can have import for us in the curriculum design." 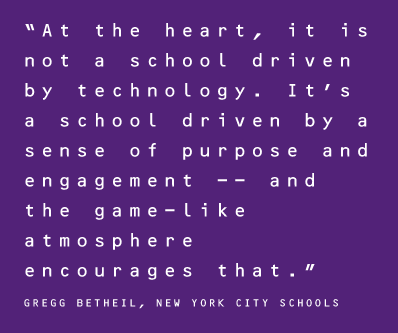 He added: "At the heart, it is not a school driven by technology. It's a school driven by a sense of purpose and engagement -- and the game-like atmosphere encourages that." On the back-and-forth between the department and Quest over blocking certain websites and pushback on new technologies, he said the groups are learning from each other. "We are working with them," he said. "They are continuing to push us. That exchange is a healthy one." Students at Quest to Learn use video games and more traditional materials in their classes. Ask the kids at Quest what they think about this "game-like" learning model, and you might expect to get juvenile answers about how games are so much more fun than books. Kids at Quest speak thoughtfully about why they're here and why they believe in games. Take Angelina Santoro. She said games that were used in her Being, Space & Place class taught her to empathize with historical figures. "I learned a lot about the -- what was it called? -- the Mesopotamians. I always thought people back then did such different things than us, but really, really, in reality, they weren't doing things that different from us," she said. "I mean, they maybe lived in mud-brick huts, but they farmed and all that. They kind of did the same things." Of the "Metric Mystery" game, she said: "I'm not a big fan of, like, science, but (this game is) not that bad. I don't mind playing it. I knew about kilograms and things like that. But it's new for me to see the metric prefixes and all this new kind of stuff. It's more challenging than my previous school." Another student, Robert Valentine, described the difference between Quest and his previous, traditional school more bluntly: "In this class, everybody's mainly awake. We have a lot of fun things to do, but at the same time we're still learning." Ameer, the teacher, says games are the best way to reach these kids. "They're familiar with a game-like experience," he said. And the games definitely grab their attention. It was a bit hard for Ameer to get the kids to stop playing. "OK. It's OK that it got a little loud in here," he said as a timer buzzed. "I'm glad you guys had fun. But for the next five minutes, I want it to be nice and quiet. The only thing I want to hear are your pens and pencils on that paper. "And remember, as almost-7th-graders, I'm expecting complete sentences. Keep in mind that ELA exams are a couple of weeks from now. So for that first question -- 'Was the game fun?' -- a simple yes or no will not be enough." The class fell silent as the students wrote. After a few minutes passed, Ameer asked for their feedback. "When I open my eyes, I'm going to see a class full of hands." He did. One of the hands that shot up belonged to a girl in a pink headband. "While I was playing the game I was kind of staring at the board a lot and I like memorized it," she said. "The metric prefixes." "I thought it was fun because it was challenging. And I like challenging. It was complex." Do you think games encourage learning? Tell us what you think in the comments.